Berry passed for 4148 yards and 37 touchdowns in college and led Oregon to three consecutive winnings seasons and a Sun Bowl victory. He was a future draft pick of the NFL Eagles (11th round) and AFL Broncos (26th round) in 1964. The Minnesota Vikings traded for his rights and Berry joined them as a backup in 1965. He saw limited action behind Fran Tarkenton, Ron VanderKelen, and later Joe Kapp, over the course of three seasons. 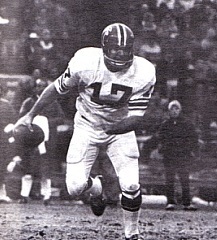 Berry threw a total of 46 passes and started one game in 1966 before being obtained by Atlanta in ‘68, where he was reunited with ex-Vikings Head Coach Norm Van Brocklin and given an opportunity to start in competition with Randy Johnson. Very competitive and a good leader, Berry was also undersized and prone to being sacked. He was an accurate passer at short range, typically rolling out and throwing to his backs and tight ends, and was selected to the Pro Bowl in 1969. Falcons went 7-6-1, the first winning record in franchise history, to finish third in the NFC West. Berry passed for a career-high 2158 yards in 1972 but, deemed too limited to continue to start, was dealt back to Minnesota. He spent the last three seasons of his career as a backup to Fran Tarkenton. Overall, Berry completed 56.4 percent of his passes for 9197 yards and 64 touchdowns, with an equal number of interceptions. 8489 yards and 57 TDs came with the Falcons.